I saw this on tv, but found many recipes on the internet afterwards. The minute I saw this potato, well... I HAD to make them. They tasted even better than they look, and the clever name grabbed me, too. The melted cheese inside and out, with the potato wrapped in bacon and BBQ sauce, and then the "Volcano Sauce, which is spiced up sour cream", this recipe really makes the ultimate baked potato! First wash the potatoes really well, we're eating the skins. Poke a few holes in each potato with a fork. Then foil each potato and bake until half way done, approx. 30-45 min at 350F. 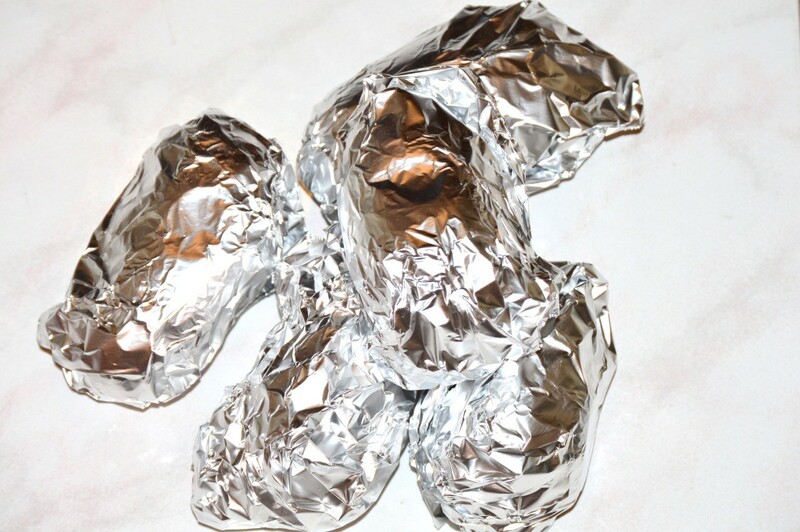 Take the half baked potatoes out of the oven, allow to cool where you can handle them. Remove any "icky" spots, since we're eating the skins on these. Cut 1/2" off the tops off to make them flat on the top. 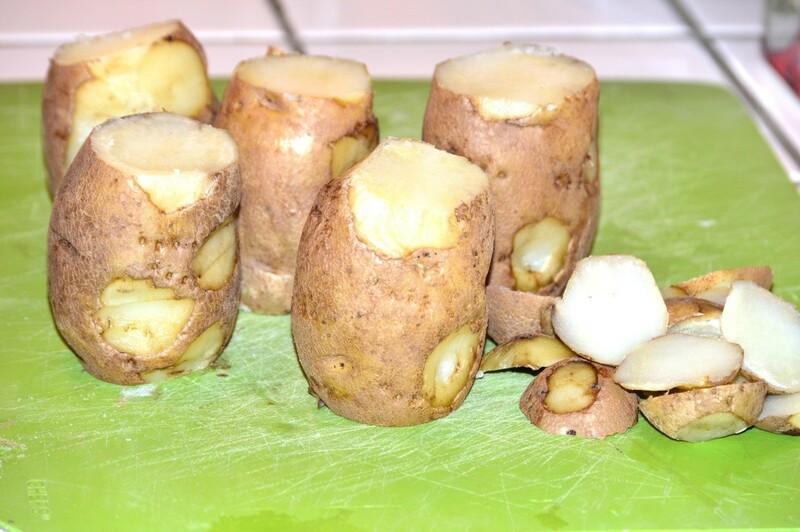 Cut about 1/2" of the bottom off each potato so they stand upright. With a spoon and serrated knife, lightly core out the centers, making sure *not* to go all the way to the bottom. 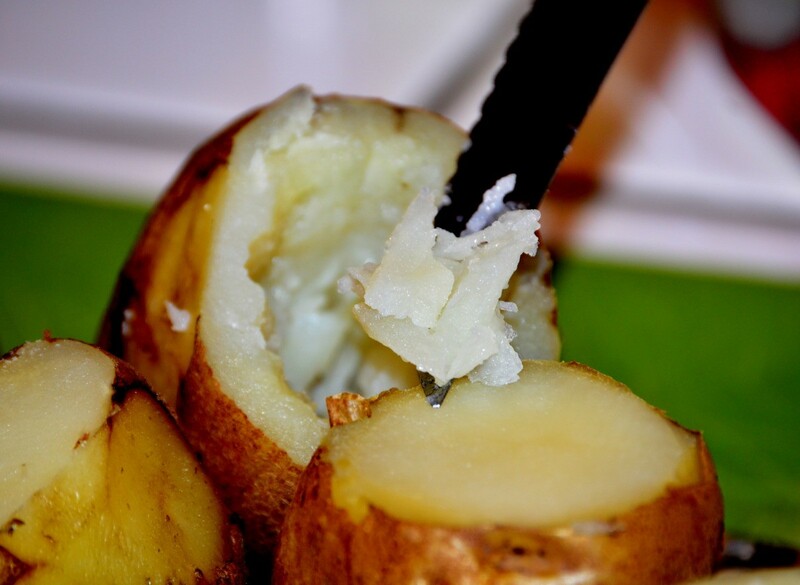 Leave some potato sides on too, as you don't want to totally core them out. * In the picture here you can see how potato is left on the side "walls". Next, we're going to stuff the cut out centers with cheese. I found that I needed more cheese than I have here, so you really want to pile up that cheese. 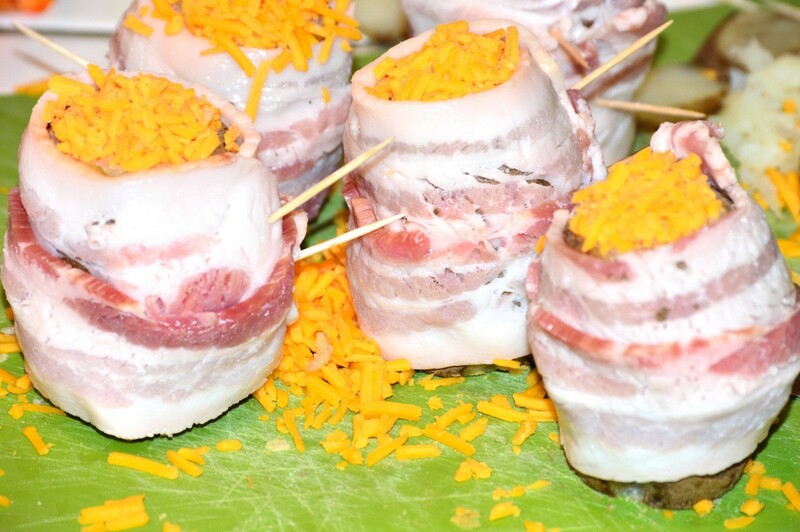 Next wrap each potato with bacon strips and use toothpicks to hold it on the potato. 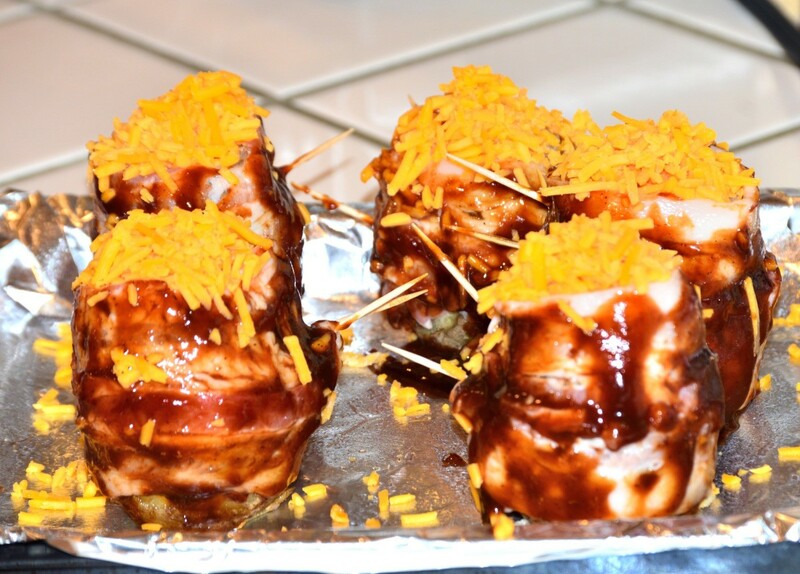 Now slather on the BBQ sauce of your choice all over the bacon that's wrapped around the potato. Put your "pre volcano potatoes" now into a lightly greased or Pam sprayed baking dish. Bake at 350F uncovered for about 20-40 min, or until potatoes are tender when poked on the outside with a tooth pick. The cheese will melt while it's cooking running down the sides (you want that as it's a volcano). 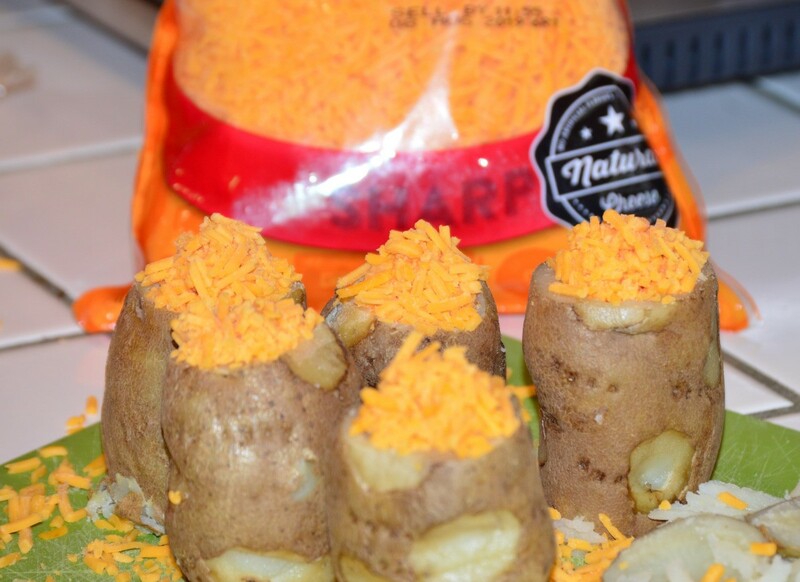 You can add more cheese "while" it's baking to enhance the effect of the cheese running down. 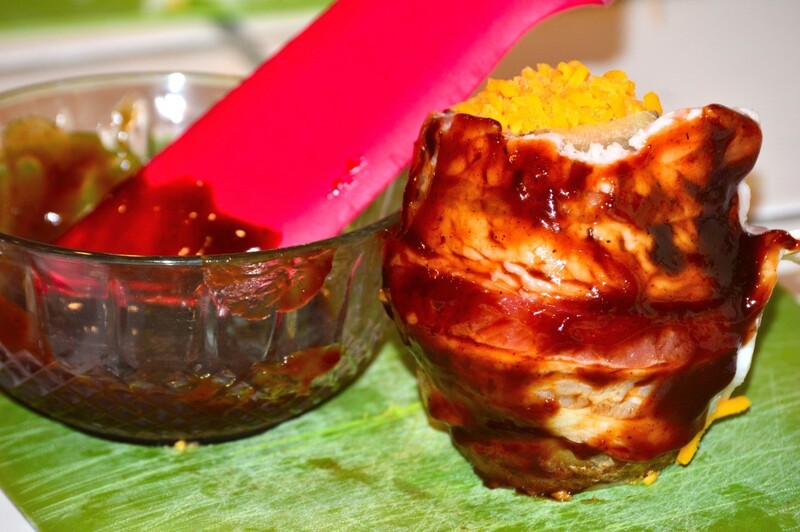 Now you can make your lava, the "volcano sauce". This can be hotter if you add more "hot sauce". 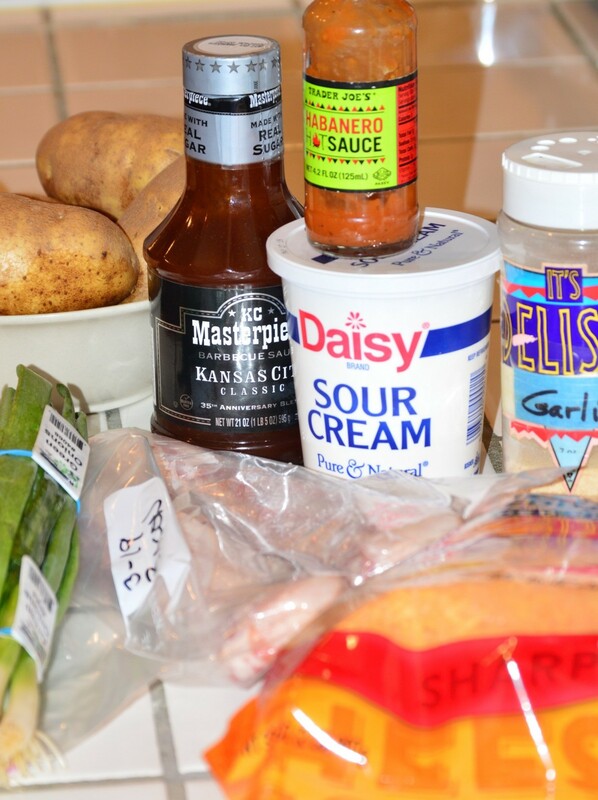 Use about 1/2 -3/4 cup of sour cream (doesn't have to be exact) and a couple of tablespoons of your hot sauce, with a pinch of garlic, paprika and salt, and mix that up. Then refrigerate the sauce until potatoes are done. 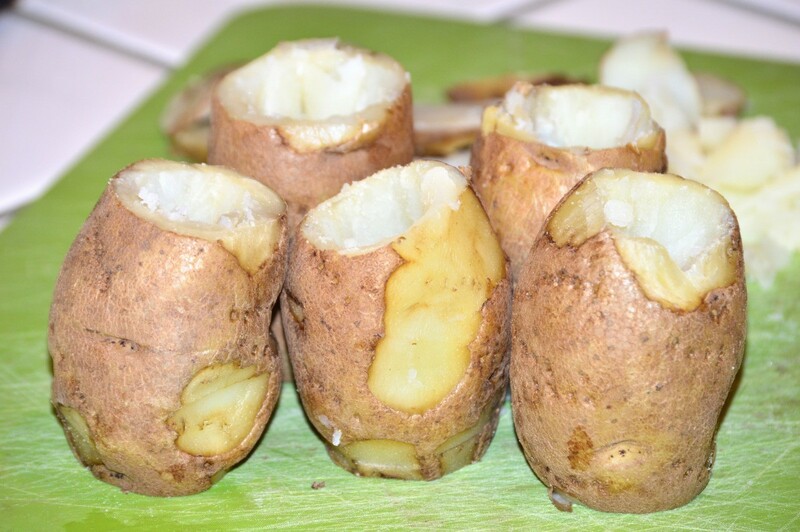 When the potatoes are done, (you can check them with a fresh tooth pick by sticking them in the side) remove from the oven, and top with the "volcano lava sauce/sour cream" mixture, a few chopped green onions or chives, and enjoy! 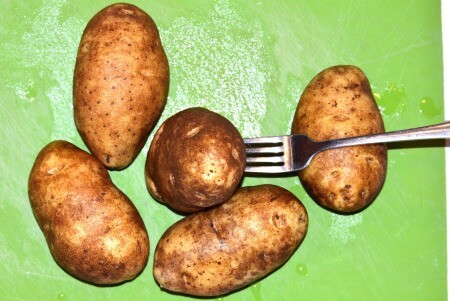 *Save the potato you've "cut out" for frying up later (if you like). Whaaaat! Suz! This looks cramazing! (My way to say crazy amazing!) YUM YUM YUM I have to make this sometime soon!! Thanks for sharing! I hope you'll like these "volcanos" as much as we did. They were fun to make too. After making them, I realized, that I should of "only put the volcano sauce on, which is( the spiced sour cream) "just prior to being eaten" as I made too "many" for just the two of us, and topped them all with the sauce, and then refrigerated the "left overs" .and well, the next day the (sour cream/volcano sauce) needed to be removed before heating them up again, then a new new batch of the sour cream/volcano sauce had to be made again to re-top the re-heated volcanos since (sour cream sauces) on a potato don't reheat well. 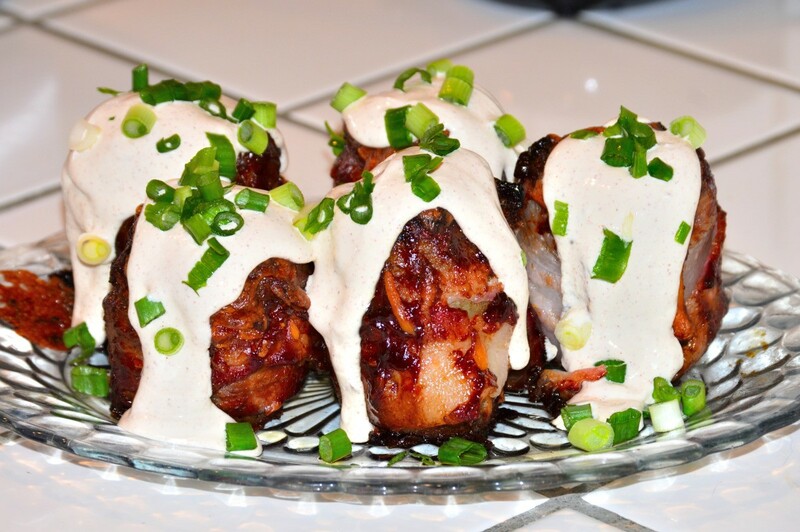 Actually, the best thing is, only put the volcano sauce/spiced sour cream sauce on the ones that are going to be eaten right away. 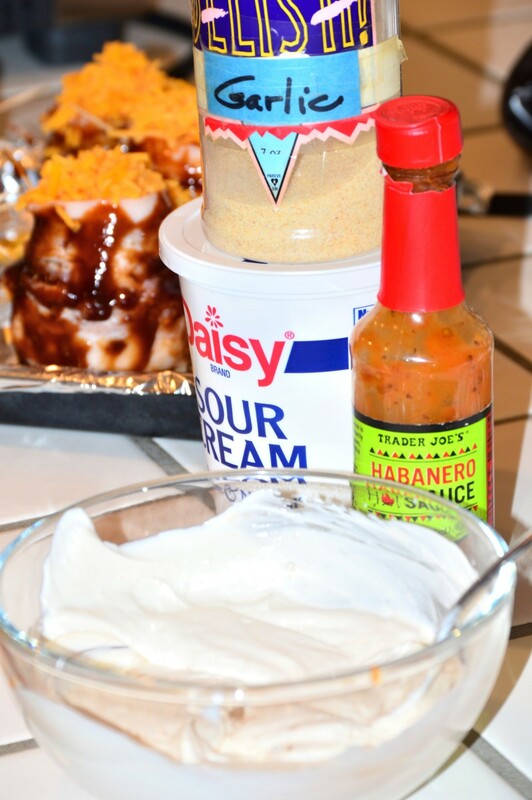 If there's left overs, then top those the next day with the "lava sauce" just before eating. Thanks for adding this tidbit of info as it will come in super handy. The next time I'll have time to do this will be at my parents after next week and I can't wait to try. I think they will love it!! :) I'll post my results!